If you like the idea of getting fresh eggs from your backyard flock, you need laying hens. You can start off with pullets, which are female chickens less than a year old. You don't need a rooster if you want eggs, although if you want to raise chicks, that's another story. Check your local zoning -- some municipalities allow backyard hens but not roosters. Your best bet for purchasing pullets is by ordering them from a commercial hatchery. You can order chicks to raise yourself. These birds have received basic vaccinations. Don't order a "straight run," even though they are less expensive, unless you want roosters. Order sexed pullets so you know they're all female. Once your girls reach the age of 4 months to 7 months of age, they should start laying. The laying age depends on a chicken's breed and the time of year. When they're ready to lay, your pullets will appear full-grown, with wattles and combs turning red and swelling. While the number of eggs vary according to breed, at the least you should expect several eggs a week from a pullet as she grows into a hen during warm weather. If you want eggs in the winter, you must put your chickens under lights. Your hens' digs can range from a basic shack to a little chicken mansion; whatever they live in you'll want to provide nest boxes full of hay or shavings. Purchase or build a nest box that's about 18 inches deep and 10 to 12 inches square. Chickens like a safe, comfortable place to lay eggs. Just make sure each hen has sufficient room. Overcrowding leads to cannibalism and other destructive behaviors. If your co-op doesn't sell an outside run, you can build one using chicken-wire mesh. Any other type of mesh is large enough for predators to get claws through. If you let your chickens have the run of the yard, keep an eye on them. Hawks, raccoons, foxes and neighbor dogs all enjoy chicken dinners. If you do keep a rooster, or if you borrow one for breeding purposes, you can produce your own pullets. The downside is that approximately half your chicks will be male, so you've got to decide what to do with them. If you're raising chickens for meat, that's not an issue, but it is if your chickens are primarily pets. Basic chicken care is fairly simple. Make sure your hens always have a supply of fresh, clean water. 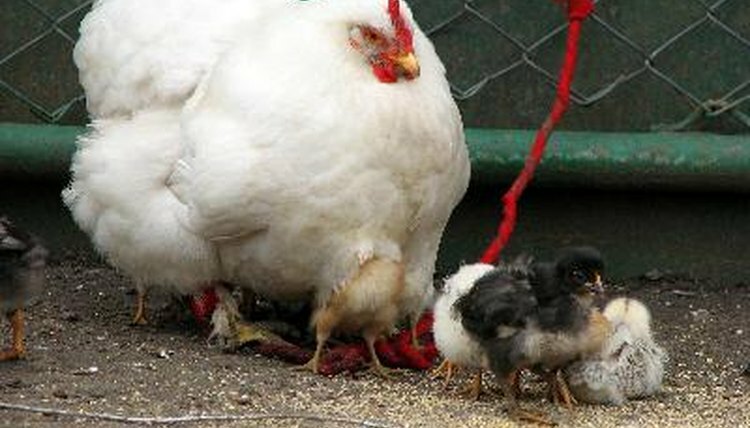 Feed them commercial chicken feed appropriate for their life stage. For example, as your chicks turn into pullets, you should give them food specifically made to provide the special nutrition laying hens need. Also provide them with grit. Chickens like greens, so give them treats of fruits and veggies. Clean the nest boxes out every couple of days, replacing the old hay or shavings. If you want your hens to produce all year, you must use artificial lighting in your henhouse. The Merck Veterinary Manual recommends the equivalent of a 60 watt bulb for every 100 square feet of henhouse, hanging approximately 7 feet above the chickens.